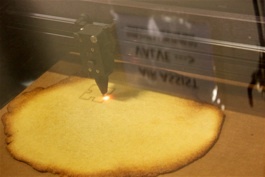 Laser-cut cookies tastes like burning cardboard. This week, we learned how to use the vinyl cutter and laser cutter. The project is to build a press-fit construction kit using the laser cutter. We were given a choice of materials: cardboard, plywood, acetate... I figured, why not cookies? After all, it’d be really rad to have a gingerbread construction kit that built castles. Due to the time constraint (20 people needed to sign up for 2 hour slots over 4 days), I decided to just do a simple proof-of-concept and save the fancy design work for later. This is the design I made in Corel Draw. The choice of cookie recipe took some thought. I wanted something with a uniform texture, fairly hard, and non-crumbly. A friend suggested animal crackers, which seemed like the perfect candidate. I wanted to compare the results with a denser cookie, so I made a batch of lemon shortbread as well. Animal crackers on the left, lemon shortbread on the right. As you can see, I got a lot better at rolling out sheets of cookie dough. One trick is to continuously trim the dough while rolling to keep the nice shape. The difficult part, I found, was in rolling out the cookie dough as evenly as possible. Going over the cookies with a rolling pin right after they come out of the oven helped too. 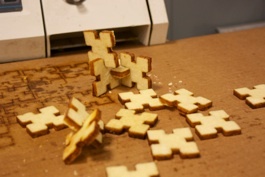 Laser cutting the cookies worked surprisingly well. The power for the first attempt was too low, and the cookie was nicely engraved instead of cut. We found that 76% power and 2.8% speed cut the cookie nicely. I ended making quite a few pieces. 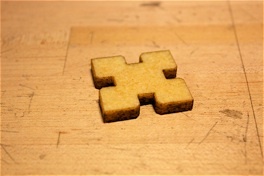 The animal cracker pieces were better for actual construction, as the lemon shortbread had a tendency to break apart. The cookies are definitely not good for eating. Cutting the cookies on top of a sheet cardboard infused them with the aroma of burnt cardboard. The caramelized protein in the cookie smelled like steak. So, it was like putting severely overcooked steak in your mouth. Here’s a brave soul. So, how good are cookies as press-fit construction kits? The answer is, surprisingly not bad. Again, the lemon shortbread cookies were dense and more moist than the animal crackers, which was great for putting pieces together, but the parts tended to snap off when the pieces were taken apart. 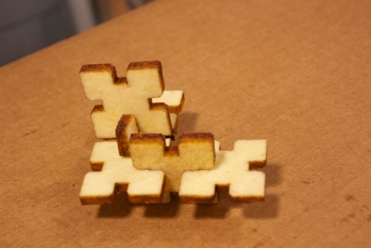 Ideally, the cookie would be resistant to sheer forces but also not be brittle. Like, you know, cardboard. 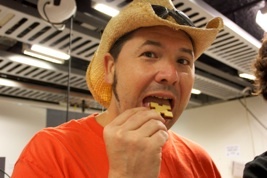 Thick nut brittles and commercial wafer cookies (the stacked, rectangular ones that look and taste like cardboard) may be well suited for press-fit construction. 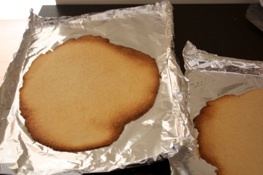 The biggest issue with cookies is controlling the thickness of the cookie sheet. In a home kitchen, it’s actually very difficult to get the uniformity of thickness required for a press-fit construction kit. 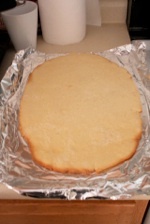 The cookie material at the center of the pan tends to end up a little thicker than the material at the edges. Instead of rolling out the dough, I may get better results rolling the dough through a pasta machine. In the lab, I compensated for the variations in thickness by cutting from the center of the sheet and manually adjusted the slot widths as I went. -Lower the power and/or cut under-baked cookies. This would minimize the burning on the sides of the cookies. -Laser cut raw steak to sear the sides. You can also give the laser cutter a raster image to sear the top. -Creme brûlée designs should be nice. It has the additional benefit of not being affected by the taste of burning cardboard. 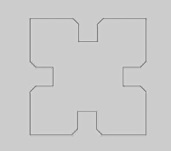 -Corel Draw handles boolean operations for polygons. By highlighting both shapes, you can go to Arrange>Shaping and pick the operation you want. -Corel Draw has a built-in chamfer tool! It’s under Windows > Dockers > Fillet/Scallop/Chamfer. 1)turn on the laser cutter. 2)check the lens to make sure it’s clean. 3)put the material to be cut on the cutting surface and align the z-focus using the focus tool. 4)make sure the air assists are turned on. -Keep an eye on the laser cutter while it’s cutting to make sure nothing catches on fire. Don’t leave! -Wait for a while (30-60 seconds) before opening the laser cutter lid. Your patience will be rewarded with a less-astringent burning smell. -The windows driver can specify different cutting instructions for different colors, which is useful for contours. For example, you can set the contour to green, while the original design remains black, and set the laser cutter to only cut green lines.